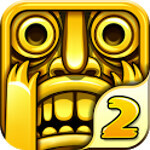 With 50 million downloads in just 13 days, Temple Run 2 has become the fastest growing mobile game of all time. The previous record was held by Angry Birds Space, which had been downloaded 50 million times in 35 days. Temple Run 2 launched on January 17th as an iOS exclusive and quickly rose to #1 in Free Apps with 6 million downloads in 24 hours. Once released in the Google Play Store and Amazon Marketplace, the game hit the top spot in both market places. The game follows your character, who has stolen an idol from the Temple, and is being chased by Evil Demon Monkeys. The original Temple Run was downloaded 170 million times and was originally 99 cents before being repriced as a free game. Not that the husband and wife team behind the mobile game is starving. In-app purchases are helping Imangi Studios, the company they formed, rake in the cash. In addition, the game has spawned Temple Run branded merchandise from clothing to board games and even a successful spin off game that was created along with Pixar. In June 2012, Imangi and Disney Pixar launched Temple Run: Brave, a mobile game that merged the world of Pixar's movie Brave with the world of Temple Run. That game soared to the top spot in the App Store soon after its release. this game is just so awesome!! imagi should better bring this to BB10 and WP8 to make that number even bigger! coz unlike angry birds which is avilable to all platform, this is i think is the best selling ever, not to mention its free! So all you have to do is plagiarize the crap out of a famous hollywood movie and you can make a million bucks. hmm... I might develop a game loosely based around the hunger games. I'll even call it "Total Hunger Running Recall Man"
This game is awesome on Nexus 7. I guess I can count myself as someone who has not downloaded the game. I suppose my point is that I have not downloaded the game yet.